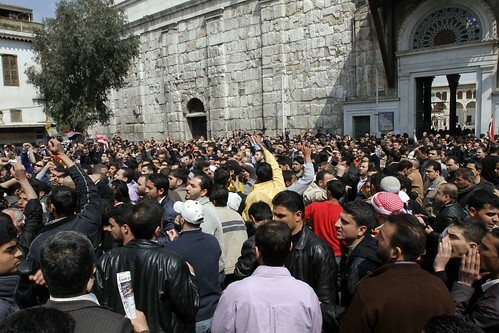 Syria’s leaders are unlikely to be tried by the International Criminal Court. Syria isn’t a party to the Rome Statute, and Russia and China will block a Security Council vote otherwise needed to trigger action by the ICC Prosecutor. No wonder that a growing number of voices keep mentioning the possibility of universal jurisdiction, if a Syrian official known to have committed egregious abuses travels to a country willing and able to arrest him. It may be a long shot, but it threatens to hold Syria’s leaders accountable for human rights abuses. Another possibility is a regional war crimes tribunal under the auspices of the Arab League. Meanwhile, just days before a negotiated ceasefire is to enter into force, Bashar al-Assad is doing what repressive leaders do: he is systematically squashing—eliminating, where possible—his opponents, while he still can. In this coercive campaign, calls for universal jurisdiction don’t hurt; they signal solidarity. But threats of unlikely punishment also won’t change the calculus of state leaders prepared to use violence to normalize their rule. Part of Syria’s tragedy is that from the outside-in, we divide people easily into camps; from the inside, the view is far more blurred and historically messy. I recently received an email from a Syrian friend who is pro-Assad. Strong and intelligent, she always bought into the regime’s propaganda machine, dutifully hanging a photo of the late Hafez al-Assad in her Damascus apartment. And yet despite the external displays, to me her fear was palpable. My friend wouldn’t condone the indiscriminate violence Assad’s forces have unleashed in Homs or Damascus, though she continues supporting (and excusing) the regime for a mix of reasons too complicated to unravel. The point is that hard-hitting political negotiations and legal accountability, including via universal jurisdiction, should remain the preferred routes for addressing violence in Syria. On the ground, the view is too convoluted for quick fixes and interventionist gambles, well meaning or not. Yes, the stakes are high and innocent lives must be protected, but the context also justifies the precautionary principle identified in the Responsibility to Protect doctrine: treading carefully in contexts where “halting or averting the atrocities or suffering” seems improbable.